Payment sent to Toby for one copy of Space Raid, Mattel style box. Edited by BriceZ, Sun Apr 20, 2014 6:04 PM. Ordering one copy Mattel style box. Sending payment to Toby. I'd like one of the mattel style box please. I would like to order (1) Mattel style box and (1) CBS style box. Payment sent to Tobie for both + shipping. Thanks guys! Edited by retrogmr, Sun Apr 20, 2014 6:21 PM. I will take one of each style of box. Looks AMAZING! ASK TO BE PLACED ON BACKORDER FOR THIS BOX STYLE. I'll take one of each style. Payment sent. Edit: I see CBS sold out. Put me on the back order list please. Edited by mphokie, Sun Apr 20, 2014 6:24 PM. I hope you make more cbs style boxes!!!! Didn't mean to forget: Congrats to Nanochess & Collectorvision team on this new release! Also thanks to GroovyBee, Rev, & anyone elsecI missed in helping out. Email question sent before payment. Thanks. Great job on Space Raid, Nanochess! Hopefully we can get an official greeting/introduction/who's who from all involved (Childhood Buddies, Collector Vision, etc). One copy for me, 1 Coleco style box. 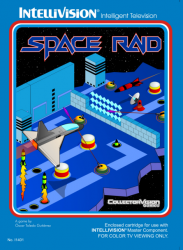 Always been a fan of "Space Raid". Will send payment shortly. Please reserve 1 Mattel copy in Mattel style box. Payment has been sent. Thanks! I'll take 2 Mattel Style. 2 Coleco Style. (Wait List I guess). Hell, you can even wait two hours anymore to get a game! That's a good sign I guess. Well, I meant CBS Style…. Edited by BBWW, Sun Apr 20, 2014 8:08 PM. 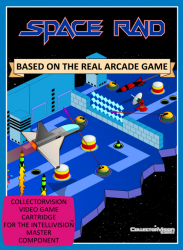 Can I send in my own ColecoVision Cart to be filled…would that help the wait list? No one should underestimate the CBS impact on Intellivision! great boxes. Oh "CBS" is the Coleco box that is on back order? 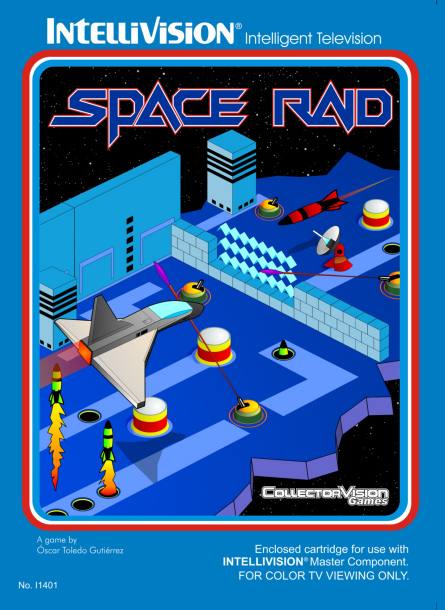 I want to play "Space Raid" now. Mattel box is fine. Back order list for CBS please. Edited by Ambrosine, Sun Apr 20, 2014 7:45 PM. I updated the terminology in first post. Also here for you. I copy for me please. I would prefer CBS, but since it out I would also take Coleco. I am not able to send the money these days, would it be okay so sent it next week? Im sure that is fine! I'll take one of each. Since the CBS Version is already sold out, please put me on the backorder list as well. Thanks!